It takes approximately 30-35 days to complete your authority process from start to finish. Below is a breakdown of each step. Colonial Insurance can help you get your authority quickly and hassle-free through our network on authority experts. Issued by the United States Department of Transportation (USDOT), the USDOT Number is the main tracking number for your trucking company. The USDOT number registers the number of trucks, drivers, and the safety rating of your company. A USDOT number does not give you the right to operate. You need to apply for your Motor Carrier Number. Issued by the Federal Motor Carrier Safety Administration (FMCSA), the Motor Carrier (MC) Number is what constitutes authority to cross state lines for hire as a motor carrier. All companies transporting freight for hire are required to obtain an MC Number. Process agents are people designated in each state that can accept legal documents on your behalf and then return them to you in your home state. BOC 3 Process agents are a requirement to obtaining federal authority. Motor carrier (trucker) must obtain Liability and Cargo insurance. It is recommended that you obtain a $1,000,000-liability policy and a $100,000 Cargo policy. You will need to obtain insurance within the first two weeks after the MC number is filed to avoid any delays in your authority processing. If you fail to get insurance on file within the first 60 days then your authority application will be dismissed. If you do not obtain insurance within that years’ time, you will have to start the authority process over again and repay all applicable fees. All motor carriers, regulated, exempt, private, interstate brokers, Freight Forwarders and leasing companies are subject to fees under the UCRA. Fees are calculated per company based on the number of commercial motor vehicles it operates. Commercial motor vehicles include the number of trucks and power units operated by the company. The International Fuel Tax Agreement (IFTA) is for trucks with a Gross Vehicle Weight over 26,000 lbs operating interstate for-hire or interstate private. All 48 states and the Provinces of Canada participate in the IFTA program. Once registered there will be quarterly tax filings due. You are required to keep track of the mileage traveled in each state and all of your fuel purchases. Some states charge a small one time registration fee to get started but usually it is free. The International Registration Plan (IRP) is for trucks with a Gross Vehicle Weight over 26,000 lbs operating interstate for-hire or interstate private. All 48 states and the Provinces of Canada participate in the IRP Program. The IRP covers the apportioned tags for the truck. 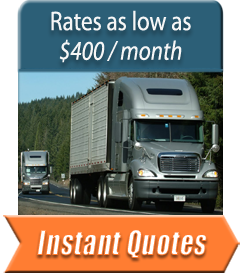 There is a yearly fee to register and operate your truck in each state or province. The cost is dependent on the miles you run in each state or province for the year. The average cost ranges from $1000 to $3000. NY, NM, KY, & OR – These states require an extra permit to operate within their borders. Once registered, there will be tax filings due based on the miles traveled in each of these states. NY charges a $15 per truck registration fee and quarterly reporting of mileage. NM charges a $7 per truck registration fee and quarterly reporting of mileage. KY does not charge a registration fee, but does require quarterly reporting of mileage. OR charges a $2000 cash deposit or security bond to register. The cash or bond will be returned if the carrier stays compliant for the initial 24 months. After registering the carrier is required to file monthly mileage reports. Remember: Colonial Insurance can help you get your authority quickly and hassle-free through our network on authority experts. Call us today at (866) 317-5764! This entry was posted in Trucking 101. Bookmark the permalink. and fleets. We are one of the most experienced commercial trucking insurance specialists in the country. © 2019 Colonial Insurance Services.